Nelson – If an informed citizenry is the best basis for democracy, Nelson has certainly become one of the most democratic places in the world. In addition to the national, state and Keene media, everyone on Nelson’s tax list of 379 persons and anyone else who wants it receives The Grapevine, a quarterly news letter. Issues thoroughly covered in the news letter have included town taxes, busing, Keene’s Junior High School to which Nelson’s fifth [seventh] graders graduate, the Route 9 bypass, the diminishing deer population and the question of restoring the old schoolhouse as an historic building. All burning, as only local issues can be. 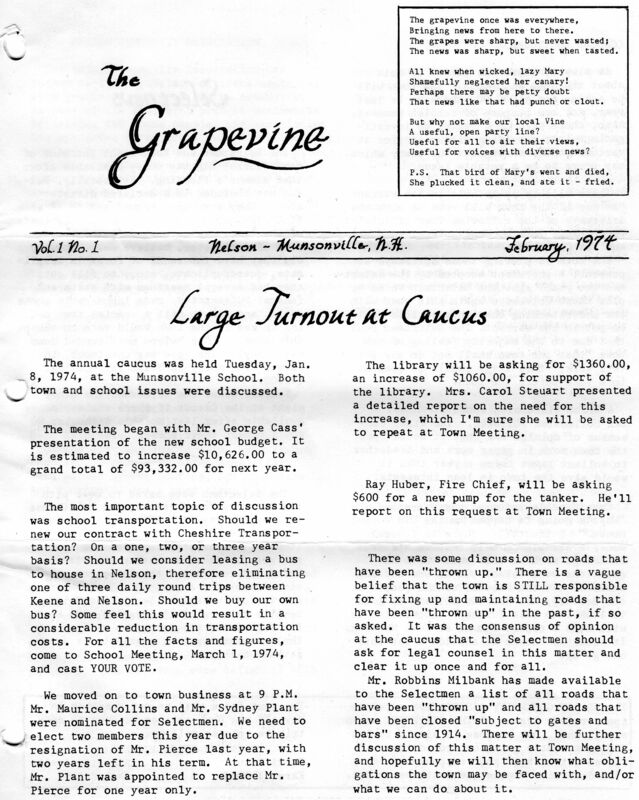 Since The Grapevine began publication there has been a dramatic increase in attendance and debate at the caucus and at the school meeting. Nelson’s annual town meetings have always been fully attended and noisy – but there now seems to be more light than heat in the hot debates, formerly noted for more heat than light. The interview with The Grapevine editors Tolman and Upton for The Sentinel was taking place on the front porch of the old Tolman farmhouse on Tolman Pond. The afternoon was crisp and sunny. Duck, a local Labrador, had temporarily taken over the dialogue, and he had no vote, only a voice. “We’ve tackled all the serious subjects and we’ve certainly raised some eyebrows,” said Teri, a young matron with sparkling eyes. “That’s what we wanted,” Teri said. In addition to being “issuey” The Grapevine has covered in a succinct fashion Nelson’s clubs: 4-H, scouts, the Granite Lake Association, the Rhythmic Choir, ladies aid, and Friends of the Library. It has run articles on local businesses, including the Granite Lake Country Store, Doug’s Bait Shop, McClure’s Mill and Murdough’s Mill and Stretch’s Country Antiques and crafts; reported on Nelson’s music: Monadnock, Apple Hill and The Coffee House. It has “Selectnews” from the town government and notes from the fire chief, who reminded everybody that burning between snow seasons requires permits from Newt Tolman or Bob West. Police news covered a few break-ins and the new volunteer rescue squad of 20 to 30 people, two of them taking an 81-hour course in emergency medical aid, and all of whom were sponsoring a square dance to buy equipment. Florence Tolman is Nelson’s long-time treasurer, widow of its long-time moderator, Frances Tolman. She is a spare, handsome woman who married Nelson when she married Fran – whose family, along with the Uptons, have been here for 200 years. Nelson has 371 year-round inhabitants within its 14,700 acres living along 30 miles of road, 25 miles of them dirt and 26 of them maintained year around. Twice that number are non-resident taxpayers who own summer cottages or houses and/or those who rent cottages regularly. A good many renters have stayed in the same cottages into the third generations on 99-year leases. The three groups are roughly divided into Nelsonites, whose houses radiate from the village green with its white-spired church, Tolman Ponders, and Munsonvillagers. Munsonville is unincorporated and within Nelson. All Nelson children from grades 1 through 5  attend the two-room schoolhouse in Munsonville. One big yellow bus and two feeder buses, usually somebody’s car, take high school students to [Munsonville and] Keene. There is a U.S Post Office serving Munsonville. Tolman Ponders and residents of Eastern Nelson get their mail courtesy of rural delivery from Marlborough. For the rest of Nelson, the state coach, or “star” route from Keene, is operated by Win French. By stage coach tradition a citizen may still ride to Keene with the mail man – for ten cents. Nelson’s telephones are either on the East Sullivan exchange or on Harrisville’s. It’s a long-distance call from one side of the village to the other. When Karen Tolman padded off in bare feet to feed her mallard ducks, goats, chickens and small son, Teri Upton hugged her bare knees. Teri’s husband works for Kingsbury Machine Tool Corp. in Keene and had came every summer to Nelson as a boy. The young couple decided to live in Nelson on his grandmother’s wood lot. Teri says she is lucky because she can stay at home with her young children and do things for her town. She is now on the Board of Selectmen, the second female ever elected, which pays $200 a year for the first year for innumerable hours of hard work, as well as being one of the unpaid editors of the news letter. Giving time to the town you live in is in the best democratic tradition. Older inhabitants have done and are doing so, and now these younger people are, too. One of them, Alouette Iselin, The Grapevine’s art editor, couldn’t come to be interviewed because she had no one with her young children and does a lot of the farming on the old Iselin place. Her husband is a prime mover on the town conservation commission. Dave Upton, Teri’s husband, ran for the school board, was narrowly defeated, but will be a candidate again. Karen’s husband, Barry, is First Selectman. Plenty of time is given freely to the news letter, but money is tight. Costs have risen to $100 an issue for the paper, printing, mailing and the rent of the carbon ribbon machine on which former executive secretary Karen types the text, to which Alouette adds the charming illustrations. The Nelson Community Association, which foots the bill is running low on funds. One new factor is particularly popular: profiles of one citizen of Nelson by another. The last one was about Earl Barrett by Russ Thomas. “Probably nobody alive knows the Granite Lake area – and particularly the watershed – better than Earl Barrett,” wrote Russ. “He knows the watershed is ‘quick’ – meaning the lake can rise 2 inches in 48 hours and drop as quickly…and therefore he says if a new highway (Route 9) should take the northern route, any pollution could have a drastic effect on its water quality. And expect to read plenty about it in The Grapevine.